As I was working on the book reviews for this issue, one of my sisters picked up this book and started looking through it. She kept exclaiming over the different photos (I may have even heard a squee or two in there) and loved the “Principles of Cuteness” and detailed instructions on adding zippers. She also liked the stitch guides but thought the diagrams were a little too small, especially if the reader had vision issues. This is the same sister who can proudly crochet a mile long chain and turn the first few rows of a baby blanket into a dress collar without thinking twice about it. 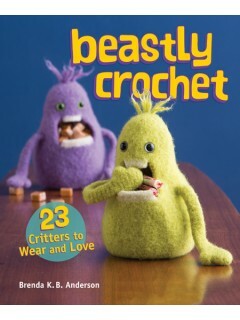 Beastly Crochet by Brenda K. B. Anderson shows just how cute beastly creatures can be. Included are 23 accessories and toys that are sure to please all ages. Each pattern includes detailed instructions, a construction plan, photos, and diagrams as needed. Designs include toys, a pillow, a blanket, sweaters, slippers, mitts, mittens, a bib, a girl’s dress, small purses, and more. The Principles of Cuteness section shows how changes in eye placement and the addition/placement of eyelids can affect how cute a creature is. The Get It Together! section shows how to stitch seams and sew appliques and dimensional pieces onto your work. The Zip It! section provides guidelines on choosing a zipper, making a zipper non-separating, shortening a zipper, and attaching it to your fabric. The end of the book includes the standard abbreviations, glossary, and index plus a listing of material sources.